The Motor City, Detroit, Michigan, is both an example of the great industrial power of the United States, and the decline of it's inner cities. Henry Ford, the Dodge brothers, and Walter Chrysler started manufacturing of the automobiles in Detroit, and it soon grew to be one of the most important industrial centers in the USA. The automobile and the resulting highway system, though, was also downtown Detroit's downfall, as "the white flight" created a city of rich commuters living in the suburbs and poor, mostly African-American residents left in downtown Detroit. The gasoline crisises of the 1970s led to hard times for the automotive industry in America, and as a result, the city of Detroit. By the 1980s, downtown Detroit was a ghost-town, a city of abandoned buildings surrounded by poor neighbourhoods that scared most travellers away. In the 1990s and 2000s, though, downtown Detroit has started to come back. New industry has moved into town. 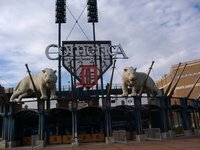 The Detroit Tigers baseball and Detroit Lions football clubs have built new downtown stadiums, returning from the suburbs, and creating a boom in restaurants and bars to serve gameday patrons. Three casinos have been built in the core, bringing in tourists and locals alike. Detroit is the birthplace of the motown sound, soul music with a dancible beat championed by the likes of Marvin Gaye, The Temptations and the Supremes. Downtown - The city's central business district. It is home to several nice parks, the country's second-largest large theatre district, great architecture, and many of the city's attractions. It is Detroit's center of life. Midtown-New Center - The city's cultural center, home to several world class museums and galleries. The area is also home to some great 1920s architecture. 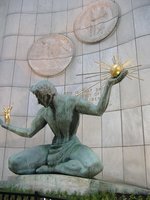 It is probably the most unique destination in Detroit. East Side - This part of the city includes much of the riverfront, Belle Isle, the historic Eastern Market, Pewabic Pottery, and more. Southwest Side - Home to many of the city's ethnic neighborhoods, such as Mexicantown and Corktown. The area is mostly known for its cuisine in these ethnic neighborhoods; however it is also home to many historical sites, such as the abandoned Michigan Central Station, Tiger Stadium, and Fort Wayne. West Side - Home to many historic neighbourhoods, the University District, and much of the infamous 8 Mile. Hamtramck-Highland Park - While not part of the City of Detroit, the cities of Hamtramck and Highland Park are surrounded by Detroit except where they border each other. Hamtramck is sometimes referred to as "Poletown" because of the large Polish population and influence in the city. Highland Park is home to many historic buildings and neighborhoods. Casinos - three casinos are in downtown Detroit: MGM Grand Detroit, Motor City Casino, and Greektown Casino. In addition, there is a casino across the river in Windsor, Ontario. Renaissance Center - a massive complex built on the Detroit river offers shopping and dining in a beautiful but confusing maze of an 6 story open attrium with multiple levels. Belle Isle - This island situated on America's busiest waterway offers hiking, beaches, watersports and an aquarium. Cranbrook - numerous attractions including the Institute of Science museum, an art museum, and the Cranbrook House and Garden. Located in Bloomfield Hills, MI, approximately 25 miles north west of downtown Detroit. Lions and Tigers and Red Wings - Detroit Tigers baseball is at Comerica Park, Detroit Lions football (NFL) is at Ford Field and Detroit Red Wings Hockey plays in the Joe Louis Arena, all downtown. Friendship Festival - held first week of July to celebrate both Canada Day and Independence Day. Includes fireworks. Detroit co-hosts the two-week-long Windsor-Detroit International Freedom Festival along with Windsor, Canada, which culminates in a fireworks display to celebrate Canada Day and the American Independence Day. Detroit has a humid continental climate. Summers from June to mid-September see average highs of 24-29 °C with lows of around 14-18 °C. Winters from December to February have highs around zero and nights between -5 °C and -8 °C. The alltime high and low are 41 °C and -29 °C! Precipitation averages around 850 mm a year with rain falling quite constantly throughout the year, summers being somewhat wetter. Snow is possible from the end of October to the beginning of April, though tends to concentrate from December to February with around 10 inches (25 centimetres) a month. Detroit Metropolitan Wayne County Airport (DTW) is the main airport, and is a major hub for Delta Airlines, which mainly has domestic flights but also a significant number of international flights, including to/from Amsterdam, Cancun, Frankfurt, Manila, Tokyo, Shanghai Pudong International Airport, Mexico City and Rome. Several dozens of other airlines serve Detroit, with many domestic services and quite a few international flights, like Amman, Paris, Toronto and London. Car: The airport is accessible from I-94 and from I-275 via Eureka Road. John D. Dingell Drive is an expressway that runs from I-94 to Eureka Road. This expressway was built in 1999 for access to the McNamara Terminal. Many other local roads all have access to the airport. There are about 11,500 parking places at the airport and both rental cars as well as taxis are widely available. Taxis are provided by MetroCab, while limousine service and luxury vehicle service is provided by MetroCars. Bus: The Suburban Mobility Authority for Regional Transportation (SMART) provides bus routes 125 and 280, one per hour, that connect the airport with the rest of Metro Detroit. Robert Q. Airbus also provides independent shuttle services, and most hotels located at the airport provide their own shuttle services as well. The Michigan Services are operated by Amtrak providing service to Detroit, operating its Wolverine service between Chicago, Illinois, and Pontiac. The Windsor Transit Tunnel Bus runs between Detroit and Windsor approximately every 20 to 30 minutes. The regular Tunnel Bus operates a short route from Windsor to downtown Detroit, including Cobo Center/Arena, Joe Louis Arena, Campus Martius Park and Hart Plaza, before returning to Windsor. During special events, the bus runs to Ford Field and Comerica Park. Proof of citizenship is required when crossing the international Windsor-Detroit border, and international travellers should check the entry requirements to the USA and Canada to ensure they are prepared. Tunnel bus service costs $3.75 for the regular route, or $4.00 for trips to Comerica Park & Ford Field on special occasions, payable in either Canadian or US funds. The Tunnel Bus schedule is available at the Transit Windsor website, though travellers going from Detroit to Windsor should note that the bus cannot wait at Tunnel platform, and so travellers are advised to arrive early. The platform for boarding the bus in Detroit is behind the Maritimes Sailor's Church on Jefferson at the entrance to the tunnel. As Detroit spreads over a large area, it is difficult to be without a car. An extensive freeway system and ample parking make the region one of the most auto-friendly in North America. Detroit has one of America's most modern freeway systems. Downtown has parking garages in strategic locations. Greektown Casino, located downtown, has a free 13-floor parking garage. Visitors are welcome to pay to park at the Renaissance Center garage. There are plenty of pay-to-park garages, lots, and valet near the Greektown/stadium areas. Premium parking right next to the stadium is well worth the extra price and usually available during a game. Downtown has an ease of entry from the freeways that may surprise new visitors. Valet parking is available at four Renaissance Center locations, the main Winter Garden entrance along the Riverfront, the Jefferson Avenue lobby, Marriott hotel entrance west, and Seldom Blues entrance west. An automated guideway transit system known as the People Mover provides a 2.9-mile loop in the downtown area and usually operates daily. The cost is $0.50 per ride, exact change required. Check the People Mover website for more information. D-DOT provides services within Detroit city limits. The Detroit Department of Transportation website lists bus schedules and routes. Costs are $1.50 per ride. SmartBus provides services to the communities surrounding Detroit. Smart Bus website lists schedules and routes. Costs are $1.50 per ride. For more details on areas, you can check their service maps. Bike rentals are available in downtown Detroit along the International Riverfront at Rivard Plaza from Wheelhouse. Detroit is one of the best cities for biking. Due to the surge and collapse of the auto industry, most streets have multiple lanes in each direction. Because of sharp population declines, there are rarely enough cars to fill all these lanes, therefore bikers can usually have a lane to themselves, a rare occurrence in most cities. Detroit is home to many budding bike co-ops, the most active is The Hub of Detroit, and its sister program Back-Alley Bikes. Both are located in the Cass corridor, on Cass Ave. and Martin Luther King Ave. Back-Alley Bikes has weekly volunteer nights, and monthly women and transgender bike workshops. Detroit is famous for the ubiquitous Coney Island. The term refers to a hot dog with chili, mustard, and chopped fresh onions; the name also applies to restaurants that serve them. The two oldest are American Coney Island and Lafayette Coney Island, next door to each other in downtown Detroit. Coney Islands can be found all over the city. People in the suburbs get their fill from local chains such as National Coney Island and Leo's Coney Island. Detroit-style pizza is a delicious and crispy deep-dish pizza that you can't really find outside Michigan (with some exceptions). Not quite as thick as Chicago-style pizza, the buttery crust is worth seeking out. The Detroit classic is Buddy's Pizza, with locations throughout the metro Detroit area. Loui's Pizza in Hazel Park makes a fine example, as well. The dozens of Jets Pizzas in the area do it right and do it quickly. Explore Detroit's Greektown, with its Greek restaurants and shops surrounding the Greektown Casino. Detroit's Mexicantown is known for Mexican cuisine at restaurants such as Mexican Village, Evie's Tamales, El Zocalo and Xochimilco. Restaurants, bakeries, and shops are located on Vernor Highway, on both the east and west sides of the Interstate 75 service drive. Hamtramck is famous for its Polish cuisine and bakeries. Choose to dine in elegance at one of Detroit's many fine restaurants a sample of which include the Coach Insignia atop the Renaissance Center Downtown, the Whitney House restaurant in Midtown, or the Opus One in the New Center. Vernor's Ginger Ale, created by Detroit pharmacist James Vernor, shares the distinction as America's oldest soft drink with Hires Root Beer. A local favorite, Detroiters pour Vernor's over ice cream (this drink is called a "Boston Cooler" in reference to Boston Blvd. in Detroit, not the city in Massachusetts). Also try Faygo soft drinks, another former Detroit based soft drink company. Detroiters enjoy Michigan Wines. A family of GM heritage, the Fisher family Coach Wines are served at the Coach Insignia Restaurant atop the GM Renaissance Center. The Detroit area also hosts a number of microbreweries. With plenty of luxurious accommodations, the Detroit area includes many fine hotels to fit all types of needs. Whether it is the riverfront ambiance of the Renaissance Center Marriott, or the old world elegance of the newly restored Westin Book-Cadillac. For a mix of the urban/suburban flair try the international style Westin Southfield-Detroit Hotel. The Leland, 400 Bagley Ave. An older hotel with interesting architecture - a good cheap place for the adventurous. Multiple bars and nightclubs inside. Courtyard Inn (Marriott), 333 E Jefferson Ave. Across from the Renaissance Center. full service hotel. Indoor pool, fitness center, restaurants, lounges, and meeting rooms. DoubleTree Suites by Hilton, 525 West Lafayette Blvd, ☎ +1 313 963-5600, fax: +1 313 963-5604. Check-in: 3PM, check-out: noon. Historic hotel, opened after renovation in 2008. The Atheneum Suite Hotel, 1000 Brush Ave, ☎ +1 313 962-2323. Luxury hotel in Greco-Roman style in Greektown. Detroit Marriott at the Renaissance Center, Jefferson Ave, btwn Brush and Beaubien (hotel entrance on west side of Renaissance Center), ☎ +1 313 568-8000, toll-free: +1-888-236-2427. Luxury hotel overlooking the riverfront. The tallest hotel in the Western Hemisphere, it's connected to the elevated rail system known as the People Mover. Guests have included Ronald Reagan. Rooms from $130 & up. Crowne Plaza Detroit Downtown Riverfront, 2 Washington Blvd, ☎ +1 313 965-0200. Full service hotel, trying to mimic French style. Guests have included George H.W. Bush. Prime location. MGM Grand Detroit Casino Resort, 1777 Third St, ☎ +1 877 888-2121. Luxury resort hotel with 30,000 ft² (2,800 m2) of meeting space and a 1,200-seat theater. Some of the major companies which have headquarters or a significant presence in metro Detroit include GM, Ford, Chrysler, Volkswagen of America, Comerica, Rock Financial/Quicken Loans, Kelly Services, Borders Group, Dominos, American Axle, DTE Energy, Compuware, Covansys, TRW, BorgWarner, ArvinMeritor, United Auto Group, Pulte Homes, Taubman Centers, Guardian Glass, Lear Seating, Masco, General Dynamics Land Systems, Delphi, AT&T, EDS, Microsoft, IBM, Google, Verizon, National City Bank, Delta Air Lines, Bank of America, and Raymond James, PwC, Ernst & Young, the FBI, and more. This being said, Detroit has been greatly affected by the nation's economic downturn and has an official unemployment rate more than double that of the nation's, which in reality may be significantly higher. The Detroit area has many civic and professional organizations. The headquarters for the Society for Automotive Engineers (SAE), Automotive, is in Troy, MI, the Society of Manufacturing Engineers in Dearborn, MI and the Center for Automotive Research (CAR) is headquartered in Ann Arbor, MI. Others include the Detroit Economic Club, the Detroit Athletic Club, the Greening of Detroit to promote urban forestry (tree planting), the Detroit Riverfront Conservancy, Detroit Renaissance, and Detroit Economic Growth Association (DEGA), and more. We have a comprehensive list of accommodation in Detroit searchable right here on Travellerspoint. You can use our map to quickly compare budget, mid-range or top of the range accommodation in Detroit and areas nearby. This is version 39. Last edited at 10:23 on Jan 9, 19 by Utrecht. 100 articles link to this page.